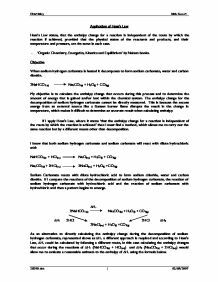 Application of Hess's Law Hess's Law states, that the enthalpy change for a reaction is independent of the route by which the reaction if achieved, provided that the physical states of the reactants and products, and their temperature and pressure, are the same in each case. - 'Organic Chemistry, Energetics, Kinetics and Equilibrium' by Nelson books. Objective When sodium hydrogen carbonate is heated it decomposes to form sodium carbonate, water and carbon dioxide. 2NaHCO3 (s) Na2CO3(s) + H2O(l) + CO2(g) My objective is to calculate the enthalpy change that occurs during this process and to determine the amount of energy that is gained and/or lost within the chemical system. The enthalpy change for the decomposition of sodium hydrogen carbonate cannot be directly measured. This is because the excess energy from an external source like a Bunsen burner flame disrupts the result in the change in temperature, which makes it difficult to determine an accurate result when calculating enthalpy. If I apply Hess's Law, where it states 'that the enthalpy change for a reaction is independent of the route by which the reaction is achieved' then I must find a method, which allows me to carry out the same reaction but by a different means other than decomposition. ...read more. The measurements for the experiment are: 1. 9.4 grams of Sodium Hydrogen Carbonate 2. 6.3 grams of Sodium Carbonate Method Prepare the list of apparatus and wear safety goggles throughout to prevent hazardous substances like HCl entering eyes. Measure out 50cm3 of HCl solution using the measuring cylinder and the bottle of 2 molar solution, remembering to judge the content by viewing the meniscus at eye level. Pour the HCl directly into the polystyrene cup avoiding spillages and ensuring that as little acid remains in the cylinder. Leave the acid in the cup and using the thermometer measure the ambient temperature of the acid and record the result. Use the spatula, the paper tray, the digital scales and the container of either the sodium hydrogen carbonate to weigh out 9.4 grams or the sodium carbonate to weigh out 6.3 grams. When weighing out correct amounts make sure not to spill any of the contents and disrupt the results, also check that the scales you are using have been set to zero before weighing and that any contaminants have been removed that could effect measurements. After weighing out the powder re-check the temperature of the acid in the polystyrene cup and alter results if necessary. ...read more. substitute them into the equation I have to write it like this: ?Hr = ?H1 - ?H2 ?Hr = 19,855 Joules - -4876.7 Joules ?Hr = 24731.7 Joules Conclusion I can now conclude that from my results that the enthalpy change for the decomposition of sodium hydrogen carbonate when heated is approximately 24731.7 Joules. To perform this experiment I have had to make several assumptions, for example, I have had to assume that the specific heat of HCl is the same as that of water, 'to raise the temperature of a gram of water by one degree's Celsius would require 4.18 Joules of energy'. I have also assumed that the solution of acid I am using is exactly 2 Molar and that throughout my experiments I have had no loss in liquids or powders due to human fault. To improve the experiment I could have made my own acid to 2 molar to increase the accuracy of my results. I could have used more sophisticated equipment, such as a more accurate digital scale or thermometer. A more appropriate lab with set conditions and both constant temperature and pressure would be more advisable than a school classroom where conditions vary randomly. 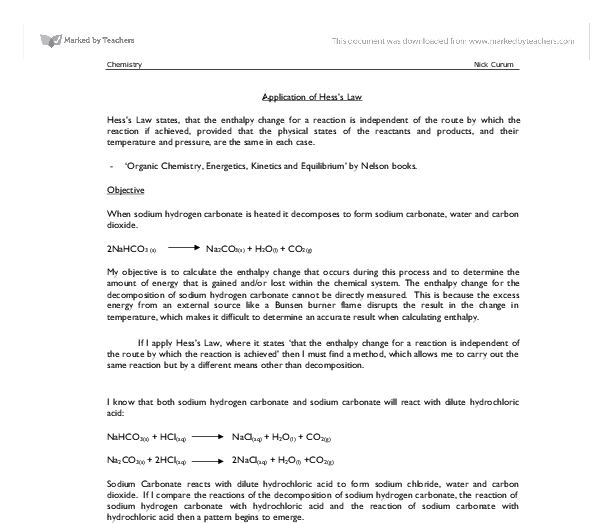 Chemistry Nick Curum Application of Hess's Law 1 02/05/2007 ...read more. This will stop it from over filling so the reactants stay in the polystyrene cup. Then measure the temperature until the reaction stops and note down its lowest peak. For the Sodium Carbonate experiment, you will need to measure out approx 5.3g of sodium carbonate, into a second weighing boat. A graphical representation of the apparatus can be shown as follows: Using a 25 cm3 burette, I accurately measured 50cm3 of 2M hydrochloric acid, and carefully poured this into my calorimeter. I then put the thermometer into place and recorded the temperature of the acid at 30 s intervals for the next three minutes. Ca2+ from the water in these cases all the stearate ions were used up in forming the scum and there wasn't enough left to form a lather. That is why in the cases where a lather did not fully form, the scum was far more visible. of approximately 2 mol dm� � HCl (hydrochloric acid) into a polystyrene beaker using a 100cm� measuring cylinder. Step 2 Weigh out accurately a weighing container containing 2.8g of calcium oxide, CaO on a balance. Record the results in a table. Step 3 Take the temperature of the acid using a 100�C thermometer and record this value in a table. This mass should be approximately 3.0g. * Measure 30cm3 of HCl using a biurette. The acid needs to be in excess as it is important that all of the sample of sodium hydrogen carbonate reacts. Table (1) shows the value that was obtained. (Methyl orange indicator) 25ml of carbonate/bicarbonate mixture was pipette into a conical flask and two drops of methyl orange was added, the solution changed from colourless to yellow. The mixture was then titrated against 0.1M HCl until the yellow colour changed to pink. NaCl +H2O(l) 1. The 25 cm3 aqueous NaOH is taken in an insulated calorimeter . The initial temperature is noted. 2. Aqueous 25 cm3 HCl in added to it. The apparatus is stirred and the final temperature is noted.